I'm a list maker and list lover. 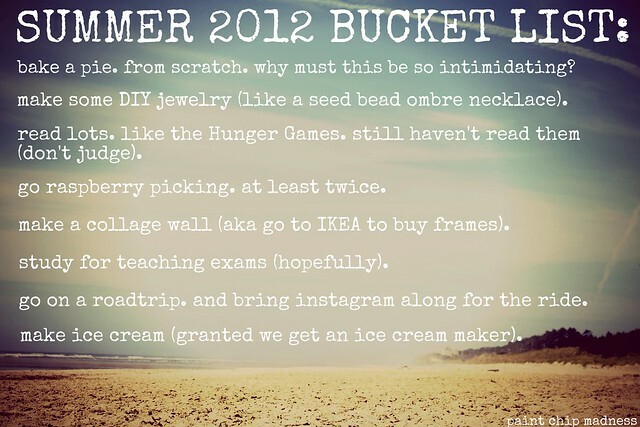 So it shouldn't be too much of a surprise that I'm coming up with a summer bucket list. Plus, what blogger isn't doing this? hopefully you can read this! For not having a job, I'm feeling like this summer is going to be pretty busy. At least this list says it will be. We'll see. psst...here's the link for that ombre necklace I was talking about. ...and I'm also going to post this as the homework the the Joy the Baker podcast. Maybe Joy and Tracy will read it? Fingers crossed! I totally want a collage wall too in my home--it's on my summer bucket list too! What a fun blog you have! Yay! I'm always excited to hear from fellow Asian blogger! thanks for leaving some love! I have a bunch of paint chips on my list! HA! I'm so glad I'm not the only one who hasn't read them all yet. I'll be sure to check out your blog soon! What are you studying to teach? I'm a teacher! I'd like to be an elementary school or possibly a preschool teacher. I've thought about special education, but I'm really not quite sure yet. It's always cool to read more blogs by teachers, I'll be sure to stop by later today! I'm loving your blog and I was getting ready to do my summer bucket list when I came across your blog..
definitely baking a pie is something I need to do too! So sorry it took me so long to get back to you. Thanks and I definitely agree, baking a pie is a summer must!